Friday will mark the second missed paycheck for many of the roughly 800,000 federal employees who are furloughed or working without pay compensation during the government shutdown, around 2,000 of whom work at Seattle-Tacoma International Airport. As the Senate this week is expected to vote on dueling proposals to end the government shutdown, federal workers at Seattle-Tacoma International Airport face the prospect of a second missed paycheck. On Tuesday, day 32 of the longest shutdown in U.S. history, about 65 Transportation Security Administration (TSA) officers, air traffic controllers and their supporters rallied outside the airport to call for an end. The protesters stood outside the International Boulevard entrance holding signs, some of which disintegrated in the rain, and chanted as passing drivers honked in support. While spirits were high, employees said they lacked faith in politicians’ ability to end the shutdown. Eddie DeLisle, regional vice president of the National Air Traffic Controllers Association, said for many of the union’s estimated 400 workers in the Seattle region it appears that there is no end in sight. 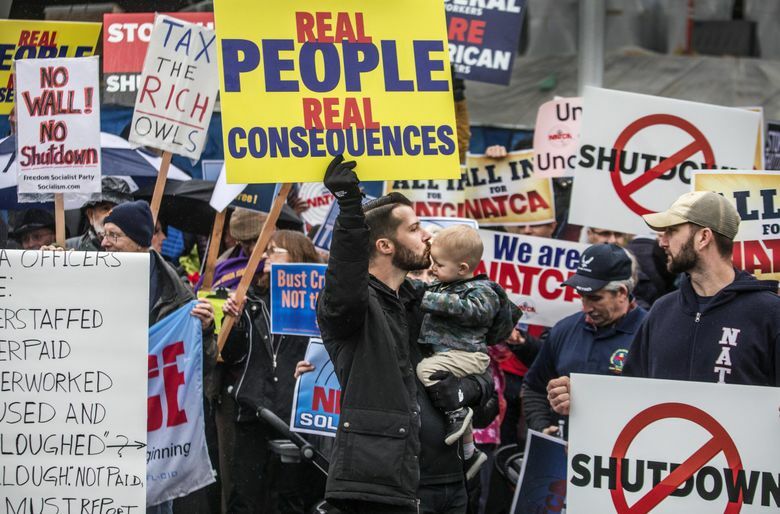 Friday will mark the second missed paycheck for many of the roughly 800,000 federal employees who are furloughed or working without pay during the shutdown, around 2,000 of whom work at Sea-Tac Airport. The Senate will vote on two proposals that could end the shutdown on Thursday — one to fund a wall being on the nation’s southern border, which Democrats are opposed to, and one to temporarily fund the government through Feb. 8. Neither are expected to pass. While there have been reports of an increase in TSA sick calls nationally, the shutdown hasn’t had a major impact on wait times at Sea-Tac so far, as workers have continued to show up without pay, Port of Seattle spokesman Perry Cooper said in an email. To make it through the shutdown, DeLisle said some of the workers he represents have taken second jobs. That’s the same situation the airport’s 800 or so TSA officers face, said Cairo D’Almeida, president of American Federation of Government Employees Local 1121. Employees have applied for food stamps and utilized food banks, something many of them have never done before, he said. Travelers have donated food and gift cards to federal employees at Sea-Tac, which have been distributed through a lottery system, D’Almeida said. The Port of Seattle is accepting non-perishable food and gift cards outside the Conference Center reception area between 7:30 a.m. and 5 p.m.
Air traffic controller Loren Cameron went to the Sea-Tac rally after he got off work on Tuesday. He would return to work that night for another shift. Cameron, who has two children, said his family is fortunate to have two incomes and a daycare that has been willing to work with them during the shutdown. But the family has had to dip into emergency savings, and Cameron said working without pay was wearing on him.